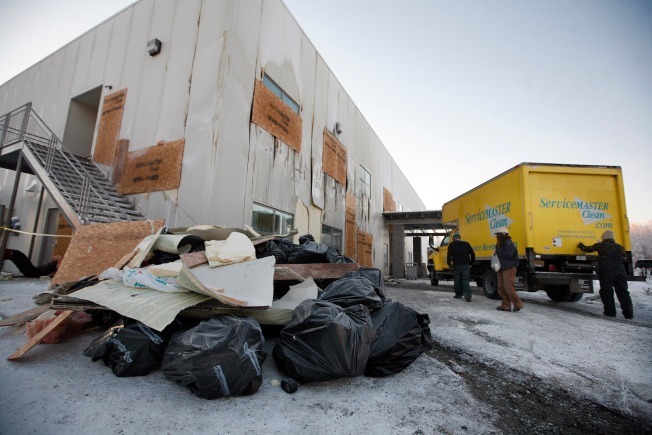 Servicemaster crews clean up the Wasilla Bible Church in Wasilla, Alaska on Sunday after a fire on Friday night badly damaged the church building. ANCHORAGE, Alaska – An accelerant was poured around the exterior of Gov. Sarah Palin's church before fire heavily damaged the building, federal investigators said Monday. The Bureau of Alcohol, Tobacco, Firearms and Explosives said the accelerant was poured at several locations around the church, including entrances. Lab tests will determine the type of substance involved. Possibilities include gasoline, kerosene, diesel fuel or even lamp oil, Agent Nick Starcevic said. The blaze was set Friday night at the main entrance of the Wasilla Bible Church while a small group, including two children, were inside. No one was injured. Fire authorities were called to the scene at 9:40 p.m., unusually early for many arson fires, Starcevic said. "It's kind of odd to do in the evening hours," he said. "I can tell you that most of the arson fires I've worked on are late nighttime, usually when no one is there." Palin, the former Republican vice presidential candidate, was not at the church at the time of the fire but visited Saturday. Her spokesman, Bill McAllister, said Monday that Palin knew about the accelerants Saturday morning before a statement she authorized was released that day. During her visit at the church, Palin told an assistant pastor she was sorry if the fire was connected to the "undeserved negative attention" the church has received since she became the vice presidential candidate Aug. 29, McAllister said. Wasilla Deputy Police Chief Greg Wood said authorities had no immediate suspects or motive.